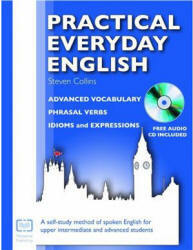 5th edition - Montserrat Publishing, 2009 - 212 p.
Practical Everyday English is the first volume in the Practical Everyday English series. It is a self-study book with audio CD, designed to improve the vocabulary of upper intermediate and advanced students of English as a foreign language. This book has a special focus on phrasal verbs, advanced vocabulary and idioms. Unlike a dictionary, this book actually teaches students how and when to use the words by giving true-to-life examples, entertaining dialogue and useful exercises. Practical Everyday English is not just a book, but a method which helps upper-intermediate and advanced students to understand and then use everyday vocabulary. Most of the material in the book is good conversational English rather than academic. However, I should like to point out that "good conversational English" does not mean street slang. There is included within the book a small amount of slang which now passes as "acceptable" English, but even members of the British Royal Family would use most of the phrases and idioms contained in these pages. He or she will already know To be bound to, To hit the roof and To get through because they appear in earlier chapters. Therefore, after reading these words and expressions time and time again, the students will find themselves being able to understand, speak and write Practical Everyday English almost automatically. Three Lessons a chapter consisting of ten or more words or expressions, plus examples. Dialogues containing words taught in that chapter. Exercises with answers at the end of the book.